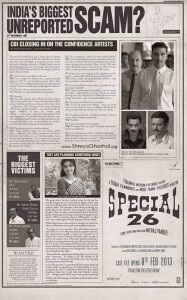 Here on this page you will find Gore Mukhde Pe Lyrics from Special Chabbis. Gore Mukhde Pe is a beautiful hindi song from 2013 bollywood film Special Chabbis. This song is composed by Himesh Reshammiya. Aman Triikha, Shreya Ghoshal and Shabab Sabri has sung this song. And of course lyrics for which you are looking is written by Shabbir Ahmed. We also have ‘Gore Mukhde Pe Video’ for you.